San Diego philanthropist T. Denny Sanford on Tuesday donated $100 million to the private, nonprofit National University System to advance its innovative teaching program. The funding allows National University to dramatically expand the Sanford Harmony social emotional learning program, which offers teachers a comprehensive toolkit of “life-transforming lessons and strategies” emphasizing diversity and inclusion; empathy and critical thinking; communication; problem-solving; and peer relationships. Already reaching schools in all 50 states, the gift will make the program available to every public school and nonprofit organization that serves students from before kindergarten to age six — as many as 30 million students. 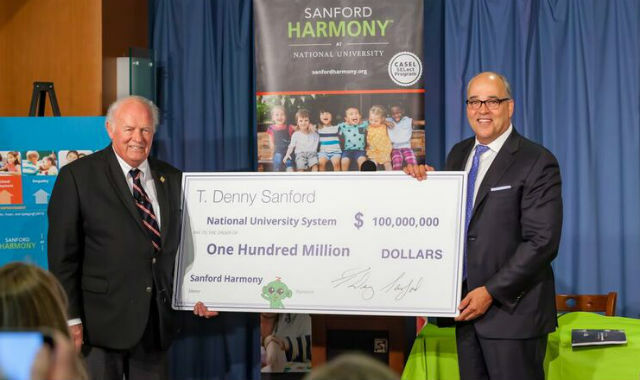 It is the largest gift ever to the National University System, which since 2014, has been the base of Sanford Harmony, and two other developed programs inspired by the philanthropist — Sanford Inspire and the Sanford Institute of Philanthropy. The National University System includes National University, John F. Kennedy University and City University of Seattle and counts more than 150,000 alumni.